No, we're not departing our beloved coop, we are moving Henbogle blog to WordPress. You can find the new and possibly improved blog here: http://henbogle.wordpress.com. Please come and find us! 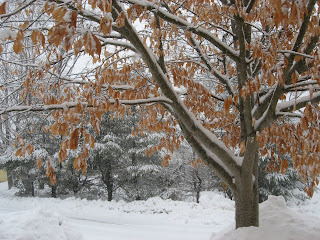 I know it is very wintry outside today in Maine (snow sleet & freezing rain, anyone?) but the astronomical facts are clear: It is the first day of Spring! Congratulations all 'round for surviving another winter. Enjoy the longer days, lengthening know until June, when the cycle reverses itself. I know I'll be spending as much time outside as I am able too. There are ever-increasing patches of bare ground in the backyard, mostly near the sugar maple and flowering crab trees, and along the path to Henbogle coop. The snow is still thigh deep in other areas, alas. The garden shed, surrounded by thigh-deep snow. Note the white garden gate to the left. Dog hair from Fisher, stuffed into the gate to be available to birds for nest-building. We cleaned out the nest boxes on Sunday, and were scolded by a cheeky tufted titmouse, probably one of the 2 broods last year to be hatched in that nest box. We decided to make good by bringing out some Fisher fur saved from his last lion-look grooming. Pippi, looking suspiciously at the camera. Is that a treat? Home sick from work with Dan's bug today, I looked out the window this morning to see Pippi out of the hen-pen, perched on the snow. On went my new boots, and I was off to catch a chicken. Fortunately, Pippi recognized the bowl in my hand as a treat container, and hop-flapped her way over to me. Back into the pen she went to share the leftover pasta with the other chooks. I wish I could say I was surprised, but no, I'm not. It turns out the green fuel, or bio fuel, revolution taking place here in this country isn't so green after all. As usual, it all comes down to greed. It is cheaper to dump bio fuel by-products than to dispose of them safely. The New York Times reported earlier this week on the illegal dumping of fuel production by products, including a tanker dumping glycerin in Missouri. an anonymous caller reported [to the Missouri Department of Natural Resources] that a tanker truck was dumping milky white goop into Belle Fountain Ditch, one of the many man-made channels that drain Missouri’s Bootheel region. That substance turned out to be glycerin from a bio-diesel plant. In January, a grand jury indicted a Missouri businessman in the discharge, which killed at least 25,000 fish and wiped out the population of fat pocketbook mussels, an endangered species. Apparently Times Beach has receded from the memory of this Missourian, or more likely, he's the moral equivalent of W.
When I bought my car (Pontiac Vibe) in 2003, I researched extensively trying to find the best combination of fuel economy, safety, reliability and model that would meet our needs. I really debated about purchasing a diesel VW Jetta Wagon, hoping to run bio-fuel in it, but decided against it. My car at the time, a VW Golf, was only slightly more reliable than a Yugo, which did not inspire hope for reliability in the Jetta, and bio-fuel was still scarce in Maine at the time. Reading this story, I'm glad I opted for the Vibe, which gets good mileage, especially once I remove the snow tires, (35+mpg hgwy) and is utterly and completely reliable. Finally, Saturday arrived after a hideously over-busy week at work. Tuesday included a lecture on atmospheric chemistry followed by a lighting demonstration. The display used an array of 100 100 watt bulbs to visually depict global energy use. Most nations use the equivalent of 40 bulbs (4,000 watts) per person; 20 bulbs – (2,000 watts) is the current world average energy use; the poorest nations, such as Eritrea, Haiti, Myanmar, Congo use 5 bulbs per person (500 watts or less). The US uses 100 bulbs per person (10,000 watts). It was interesting, and theoretically would have been visible to outer space but for heavy cloud cover. Dan has had the flu, so I made some chicken soup Wednesday. Loaded with veggies, it hit the spot, and provided enough leftovers for him to have something nutritious to eat for the rest of the week while I was super busy at work. Friday I collapsed after my big event, but today we went shopping at Maine Department store Reny's where I picked up an antidote to mud season --pink and green plaid boots. I am sure the chickens will be impressed; I think I'll go and show the girls the new boots now. Kyle at age 1 --look at that strawberry blonde hair. Happy 18th birthday! We love you!! Look for more photos tomorrow after the party. The remnants of Wednesday's storm. I heard this morning that more is on the way for Friday night and Saturday. Saturday's pizza was so good, I made more today. The microhood works great, I didn't set the smoke detectors off yesterday or today. Whoo hoo! We never did get a snowfall total for the March 1 storm. 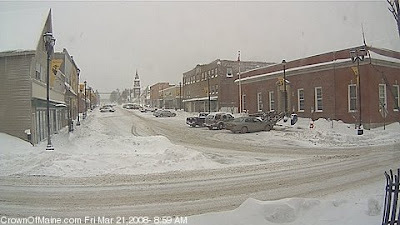 By the time the snow slowed down, it was 40°F and the snow had significantly compacted into a sodden, heavy mass. It snowed all day, though, slowing considerably late in the day, but flakes were still drifting down when our friends Bill and Michelle headed home post-pizza a little after 9 pm. We shoveled in the afternoon Saturday, enough to get by, and today in the sunshine, batted clean-up. There was a chilly breeze, but the March sun really warmed things up. Spring is clearly on the way, snowstorms be damned. The girls were very happy to have the snow removed from the yard around Henbogle coop, and even happier to see the big plate of leftover pasta, fried rice, and aging spinach we brought. We have a LOT of snow. 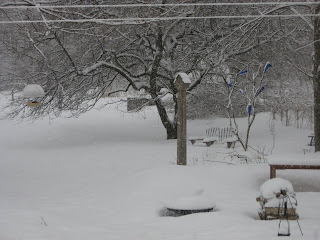 Temps today and yesterday were in the high 30°-40° F and the snow is melting quickly but it is still amazingly deep even in the yard. We've given up shoveling the deck off, we have no where to put the snow. We just keep a path to the door cleared. In the photos on the left above and to the right, this is the path between the 2 new garden beds I planted last summer. Hard to imagine now, isn't it? In the front yard, Dan is atop the snow filling the front yard feeder, which normally is level with his head. The snow he is standing on is another lovely perennial garden, buried under 3 feet of snow. We noticed that the heavy snowbanks have snapped several of the lower branches off the spruce in the front yard (you can see a few of the branches framing Dan in the photo). That tree gives the front yard some privacy, and more importantly, shields the house from the glare of the streetlight. I hope that we don't lose too many more branches from this poor tree. I sure hope this is the last big snow of the season. Here's hoping the old adage about March is true, in like a lion, out like a lamb, as here at Henbogle it is snowing hard at 8:50 am, and the NWS forecast is calling for 5-9 additional inches today atop the 3" or so that fell overnight. Sigh. I am so DONE with winter and snow, but apparently the message has yet to be received by the weather gods. The snowy winter is really feeding my unreasonable longing for a greenhouse. The girls are out in the hendome. They weren't too happy about the snow on the ground, but the lure of treats was too strong to resist. The other day Dan came upon a bale of hay fallen from a truck, and stopped to bring it home for the girls. He threw the bale in the dome and they are in hen heaven. We'd intended to stop by the feed store and buy a bale Sunday, but mis-timed it and the store was closed, so the girls had to do without. Scratching through the bale and eating the seeds gives them something to do and keeps them happy. This morning I threw a couple of handfuls of scratch into the hay and they'll be occupied happily for some time. 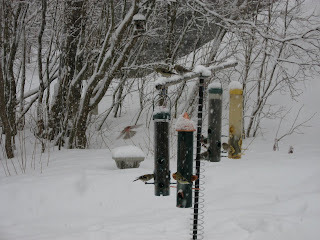 On my way back to the house I refilled all the bird feeders. I'd say at this point we've gone through about 125 lbs of sunflower seed, and 15 lbs of thistle seed. 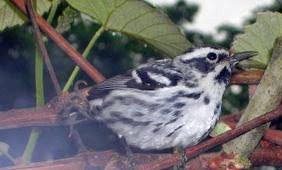 It is money well spent, feeder bird watching is more entertaining than cable tv anyday. I find the upside down finch feeder especially amusing. Some of the finches, and even a few chickadees, figure it out right away, but there are always a few who never do get the idea. Well, time to make some pizza dough, I think tonight will be an excellent night for a big pizza feed. As I nearly always manage to set the smoke detectors off when I make pizza, it's time to test out the new microhood and see how good a job of smoke removal it does. Once I get the dough made, it will be time to buckle down and make some decisions about what seeds I will be ordering. I've been a quivering blob of indecision, but it is more than time to get off the pot, as they say, or I'll be SOL when order fulfillment time comes around!